The author has stressed that the skin makeup/layout and language files will probably change before the end so skin/translation authors should be prepared to change things with each update or wait for a final release. 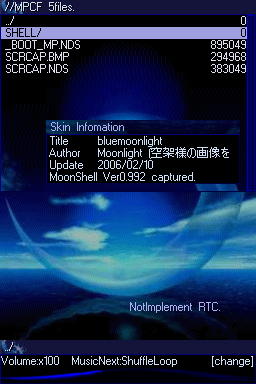 For those just hearing of moonshell it is an application for the DS that plays video (DPG format), audio (many formats), text and pictures as well as launching homebrew code for some carts. The following is a crude translation of the text that appears at the authors blog (link below). 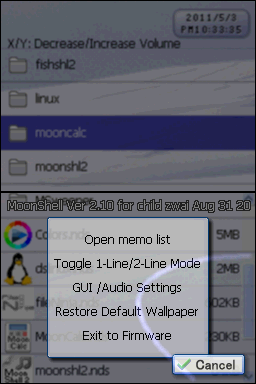 You can now choose to launch an application depending on the extension of the file (see moonshl2/extlink/readme.txt), note soft reset or similar to return to moonshell2 is not possible. IPK images are now viewable. Holding select for more than 3 seconds creates a screenshot of the current screen (aimed at skin makers). Scrolling text on touch screen available outside of the scroll bar. You can disable L and R when closing the screen. 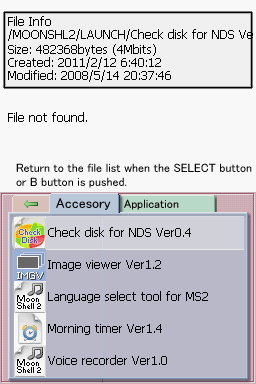 Launch_Tab0_Launch.png and Launch_Tab1_NDS.png changed dimensions to 256x192 pixels. Commands launched using A, B, L and R now work properly. Fixed a bug with unsupported file types in list view. 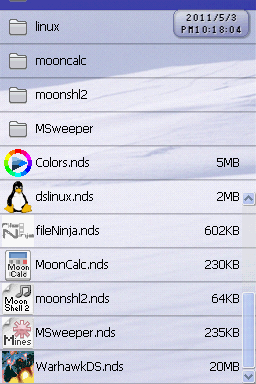 Fixed a bug with the option to hide file extensions hiding folder names.